A Barbie is not the only doll little girls enjoy dressing in cute, fashionable outfits. 18-inch dolls offer a body type more realistic to the children playing them. Crochet a sweet shirt for your child's 18-inch doll using this quick and easy pattern. This top has been fit-tested on an American Girl doll, but will fit any 18-inch doll you may have. Make several shirts in a variety of shades to wear with skirts, shorts or pants. This shirt is made using Red Heart worsted weight yarn. Red Heart yarn is readily available in most stores that sell yarn, but can also be purchased online. Click on the pattern image to download and print the instructions. For more assistance with Adobe printables try these helpful tips. No crochet pattern is written in stone. Adjustments can always be made to fit individual circumstances and creativity. 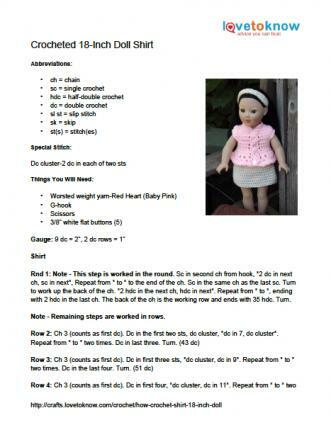 If you are stumped on where to begin, try these tips for altering the doll's shirt. Other worsted weight yarn brands can be used for this project, but the gauge should be checked before beginning. If your gauge does not match the pattern gauge, a bigger or smaller hook will provide the adjustments needed. If buttons are too difficult for the child dressing the doll, snaps can be sewn between the overlap of the placket and the buttons can be sewn to the outside for embellishment. Imagination and playtime with dolls often imitates the personality and dreams of the children who play with them. Expand their dolls' wardrobes to encourage that imagination with some of these other patterns. The crocheted wrap top on ABC Knitting Patterns is a fun option to try. While the pattern is easy, this airy sun top is made using crochet thread and would be better attempted by a crocheter with intermediate skills. Go a bit retro with this adorable halter from NyanPon. This pattern is super quick and easy. It would be a great project for someone just learning to crochet. Kimations has a crocheted T-shirt style top that will enhance the versatility of of your doll's wardrobe. Make one in every color of the rainbow. This is also an easy pattern that a beginner can make without difficulty. When shopping for birthdays, holidays or those "just because" moments, add yarn to your shopping list and crochet a new doll wardrobe for a special little child. With no batteries and no plastic parts to break, it will be a gift that continues to bring enjoyment for many years.